Give back! Give a pack! A full mile away from the starting line. When a family is living paycheck to paycheck, children learn to make do with what they have-- even if that means returning to school without the supplies they need to succeed. But this year won’t be that way. Because this year there’s you… and Operation Backpack®. 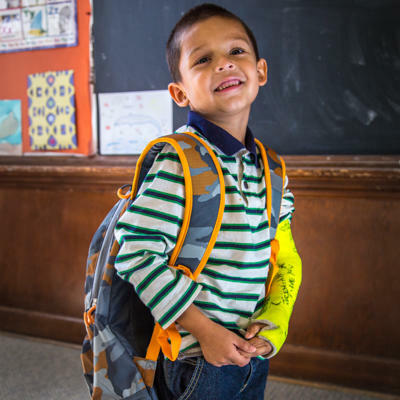 Operation Backpack® connects children in need with a new backpack filled with grade-specific school supplies. But it’s not just about paper, pens, or binders-- it’s about giving the gift of opportunity in school and life that many children will not receive otherwise. Your donation to Operation Backpack isn’t a gift-- it’s a game changer. With your help, Operation Backpack® is leveling our nation’s academic playing field. Join today to prepare a child in your community for tomorrow’s success! Give Back. Give a Pack.